Ironically, the morning after I posted this review, the tongue of the left boot snapped off. Actually, it didn’t even snap. I reached under the bench to grab the boot to put it on and all that came out was the tongue. No pop, crack, or any resistance. A little confounded I just stared at it for a moment. Many of my previous gear reviews have commented on the customer service of the companies, sometimes more so than actually the equipment itself. Well, I can now report that the Crispi reps for the US, Alpina Sports, are great. I connected with Ken who got the part number from me and said “yup, I have one of those, in charcoal gray instead of blue, is that OK?” That was fine by me and he put it in the mail, no charge. It should be a pretty easy fix with just two very accessible hex screws. So, with a few more days on the mountain, I needed another pair of boots. So I took the gondola down into Breckenridge Town and stopped by Mountain Outfitters, one of the very few places in Breck to carry tele gear. 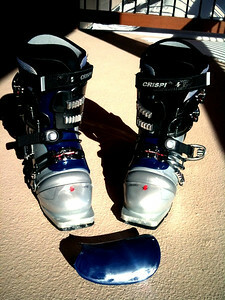 They don’t cary Crispi, so I got a pair of shiny red Scarpa T-race boots. If I get a feel for them, maybe I’ll post a review on those as well. As was typical for me and Scarpa, they ran a little narrow so I had to size up for the best fit. 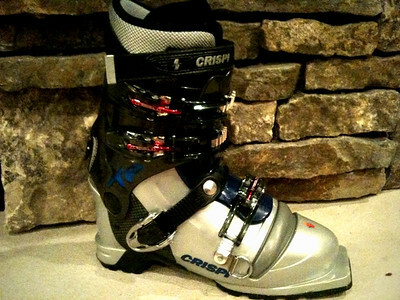 I’ve also come to realize in skiing on the Scarpa boots, the ring for the safety leash is further up on the top of the foot, actually on top of the first (lowest) buckle while on the Crispi boot, the ring is along the side of the boot. This may have placed the shackle for the safety leash, which broke while on some hard packed steep terrain, at risk putting the fault of the break on the boot instead of the G3 binding. I suspect the shackle somehow ended up between the snow and the metal edge of the K2 Work Stinx ski. Since the shackle was spliced into the cable leash, I had to replace the whole thing with a small piece of webbing. Fortunately, the shackles can be picked up pretty cheaply at a hardware store (in the marine section of all places!). These boots are going on their 4th season of pretty rigorous use and they are holding up remarkably. If and when I need another pair of tele boots, I’m sure they will be Crispi’s.